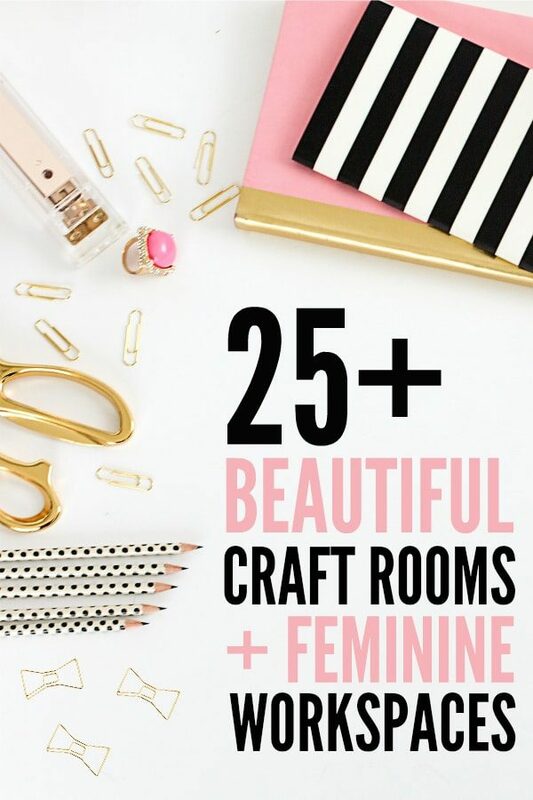 Are your craft supplies taking over your craft room or creative space and it’s becoming a complete freakin’ nightmare and you’re terrified you’ll become trapped and then suffocated after some falling yarn? 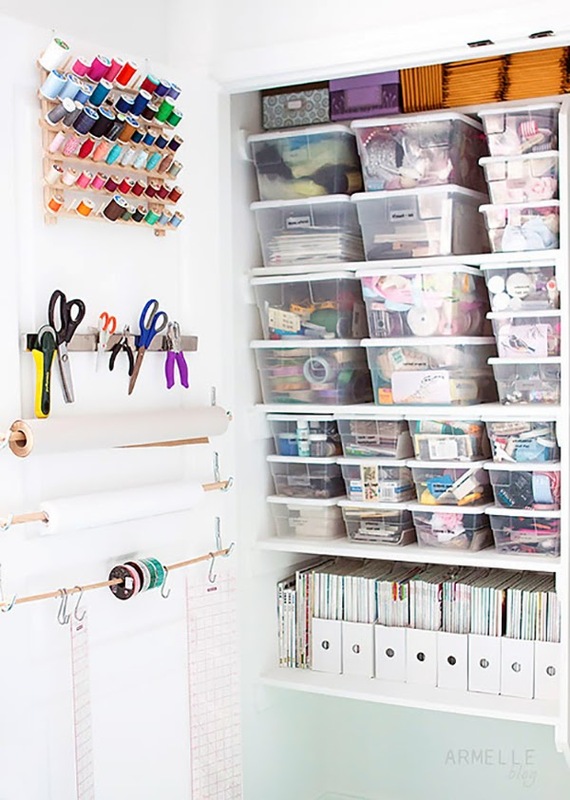 I’ve decided that it’s time to share some of the amazing storage ideas for the Craft Room and hopefully it will motivate me to tidy up. Hopefully! 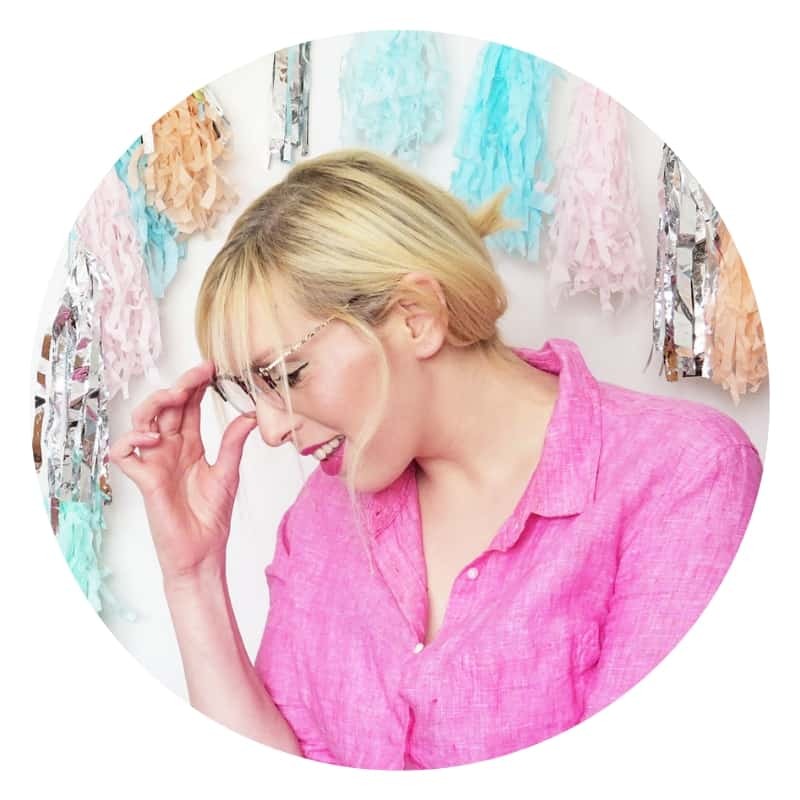 My craft room is coming down with craft supplies, and I love finding new ways to organise my favourite products. The above image is of Leenah’s desk from Finding Nana; I love this lady! A pure talent and I’m very envious of her organising skills. Those are some serious skills! 1. Putting these Alex drawers* on tall legs and adding this type of desktop storage* is genius. 2.Use tiered snapware storage* for projects that you can hide in a closet. 3.Using this kind of divided storage crate* is perfect for storing paints or these gorgeous glimmer misting sprays. The Grab’n’Go Portable Storage Box For Your Craft Supplies! Use code HEARTCO at checkout to save 10%! The Grab’N’Go Storage Range comes in small, medium and large. Mine is the medium size box in light blue and it can get quite heavy once you fill it up! I am honestly obsessed with my Grab’n’Go! It was offered as a gift and I genuinely don’t accept gifts in exchange for social media shares or sharing on my blog, but when I was offered it I knew it was made for me. 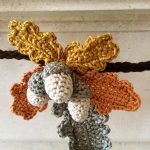 Due to my chronic medical conditions, I’m not always well enough to be in my craft room. Sitting upright for long periods of time can be an issue. Being able to lie down and have the Grab’N’Go beside me is SO handy! It’s gorgeous, and I love all of the baskets like these* that Leenah uses to organise her supplies. I had to get my hands on one of those Smiggle cases* and I LOVE it! It holds all of my lettering supplies. I had to share this little room because that stool almost matches my fabulous vintage chair that I found on Gumtree! I love those little white drawers underneath the desk, I can’t find drawers the same but I’ve found some that are quite similar distressed style drawers available. 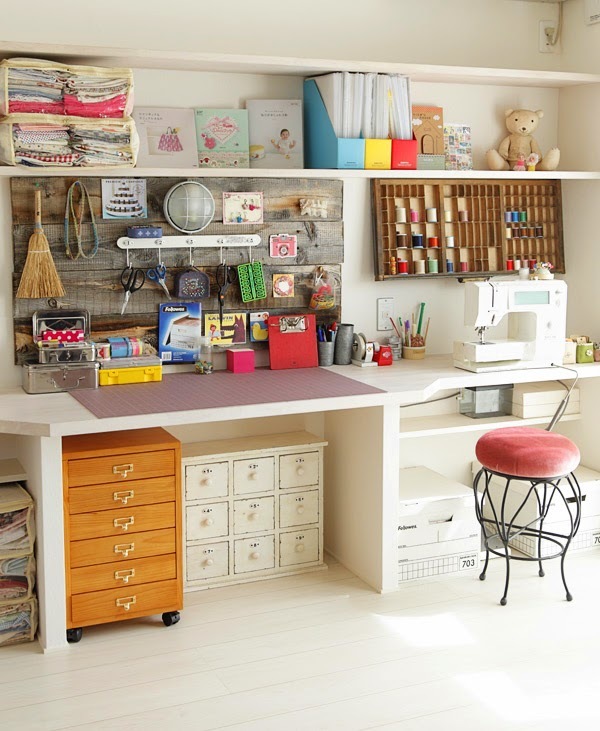 Speaking of desks… have you seen this Crea Ultimate Crafting desk?! Be still my beating heart! It has SO much storage!!! The palette style wood on the wall with hooks was a great idea for hanging storage. This is my Samsonite case that I empty out and refill with whatever craft supplies I need for a project I am working on. 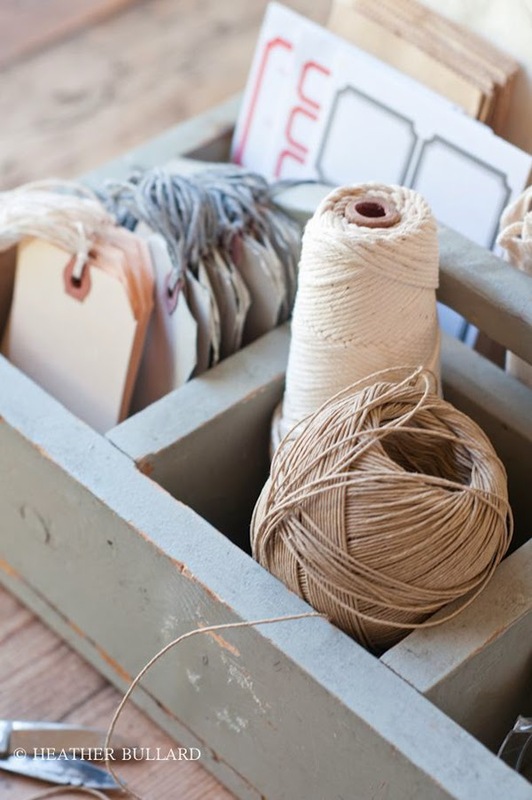 Small wooden trugs make great storage for ribbons and spools. 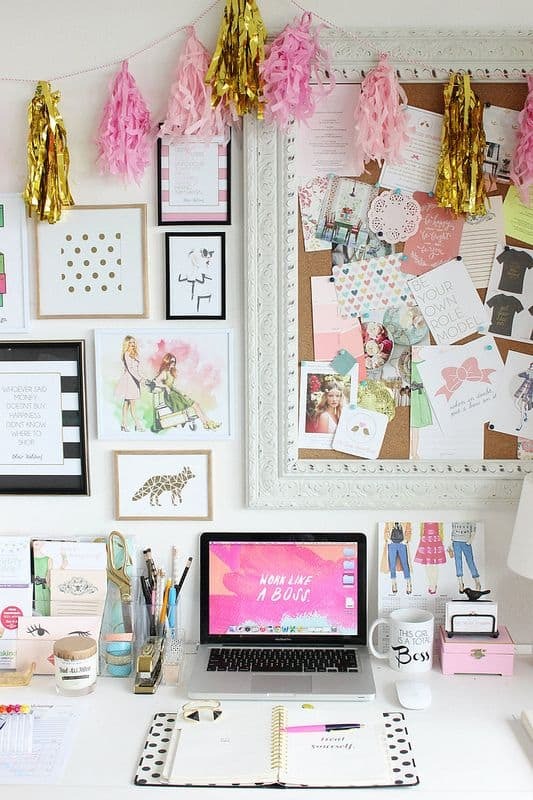 Related: 10 Things You Must Have In Your Creative Craft Space! 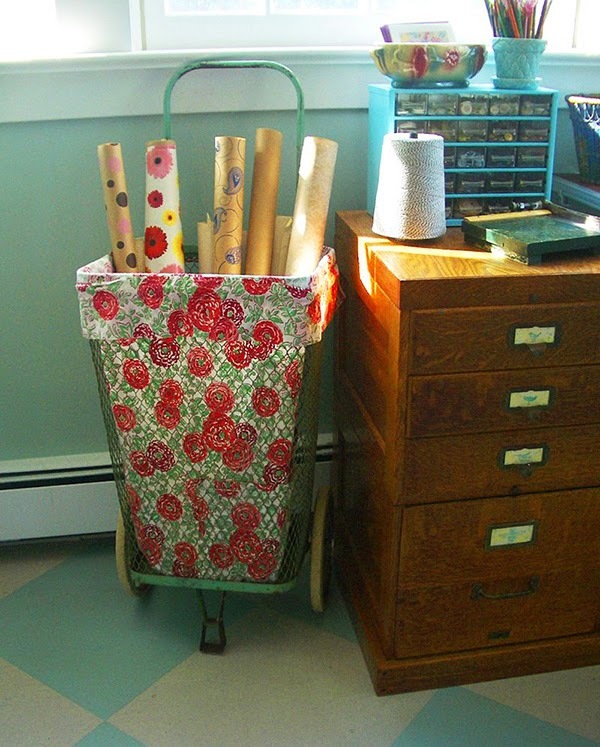 Wire Baskets just like these make gorgeous storage for fabric. 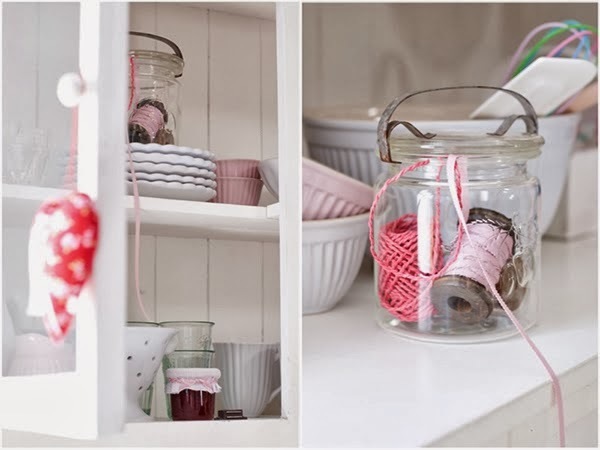 Fill vintage jam jars with beautiful ribbons and twines! 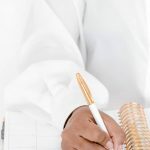 And now we get to my newest favourite blog! 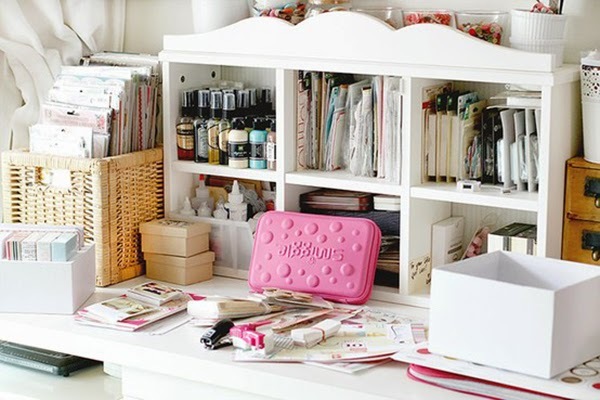 Magda Mizera is an excellent scrapbooker and crafter and has lovely craft storage on her desk. Go find jars, tins and old wooden boxes to store your crafty goodies! I love this little box with Heidi Swapp Color Shine Sprays. The blue Heidi Swapp Color Shine spray is THE most incredible, intense shade of metallic blue! I’d love a car in that shade. Use the top of a dressing table (can be purchased separately). 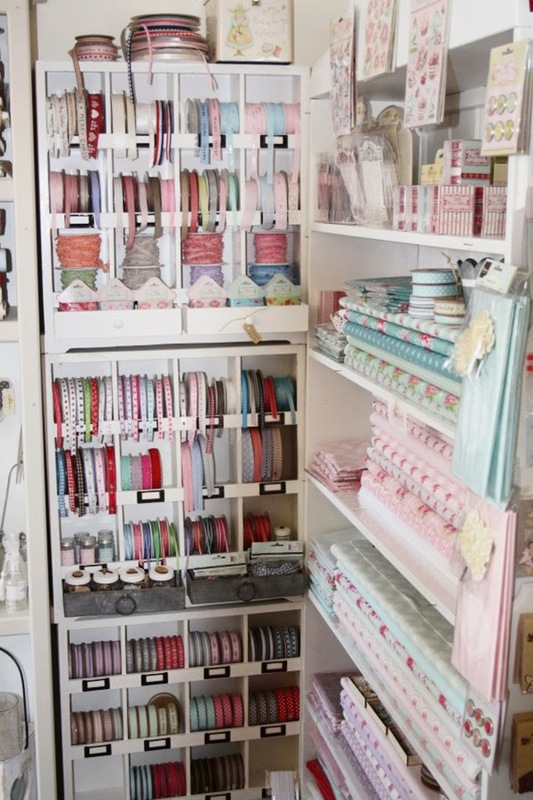 I know this is a shop… but I thought the ribbon storage and fabric on bolts was a very inspiring way to display your fabric and ribbon stash. Image Via this link. 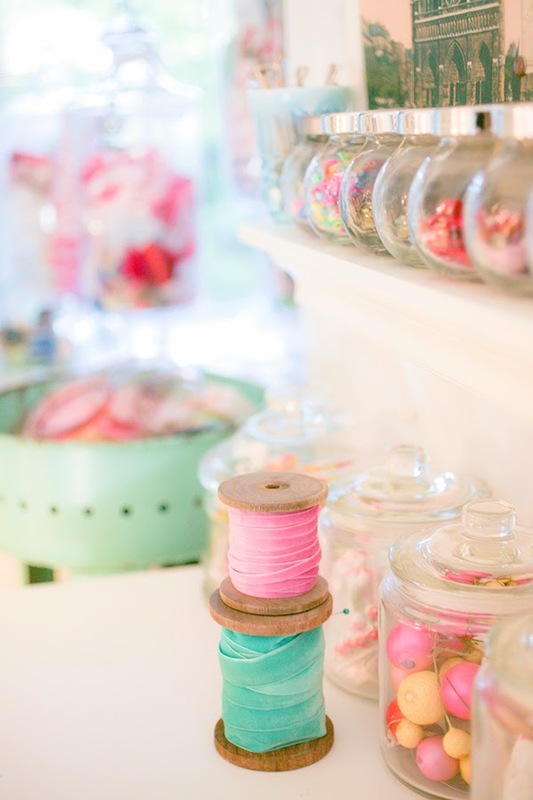 I love Maureen Mae’s craft room, and I love the consistency in the jars, i.e., not all mixed. Use some glass candy jars, grab yourself a little wall shelf/picture ledge and some Ikea spice jars for small craft supplies. Visit Maureen Mae’s Flickr page. I really love how these Alex drawers have been put on a table to make them at a more manageable height. These geometric style custom drawer knobs are rather unique aren’t they. They’re made from wooden blocks and just painted. I also love how the table top Ikea Moppe drawers have been painted in pastel shades. 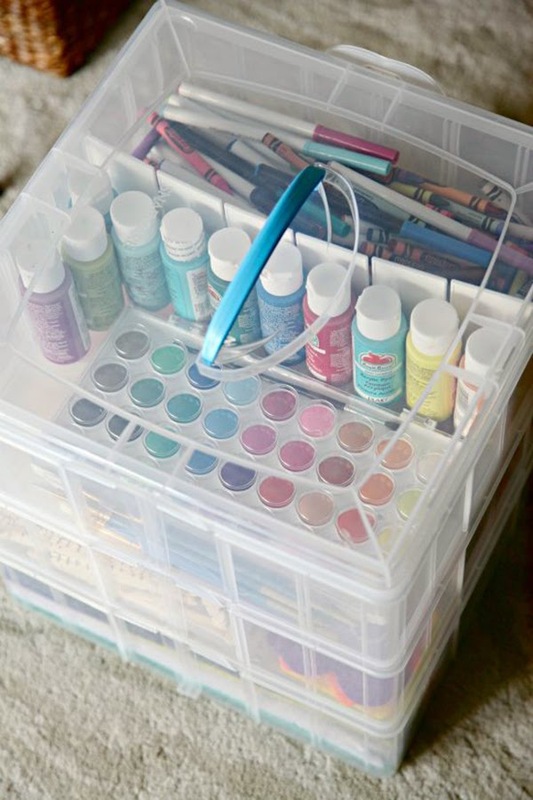 Snapware storage bin via iHeartOrganizing is a great way of storing lots of craft supplies if you were wandering around the house and move your crafts from room to room. 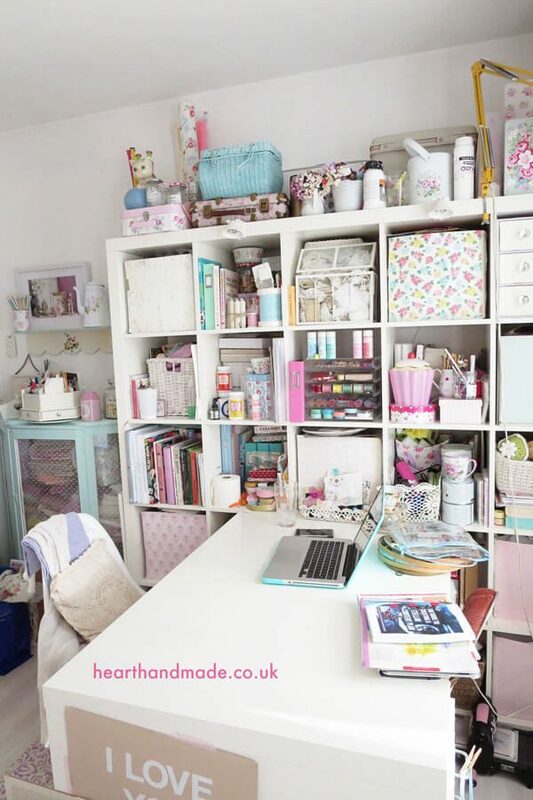 This would be perfect for me to organise my December daily art supplies. 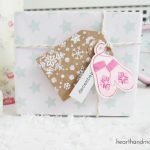 This post was from me, using Cath Kidston Tupperware, washi tape and parcel tags for ribbons, trims and seam binding storage. Get cute lunch boxes to use as storage for your ribbons!! My ribbons in my little Cath Kidston lunch box from the 2012 range. Another, deeper crate for storage. I must find myself some bottle crates to repurpose! via Heather Bullard. Look what Janna found in Tiger stores! A super cute etagere/cupcake stand. I’m so happy I found one similar here. 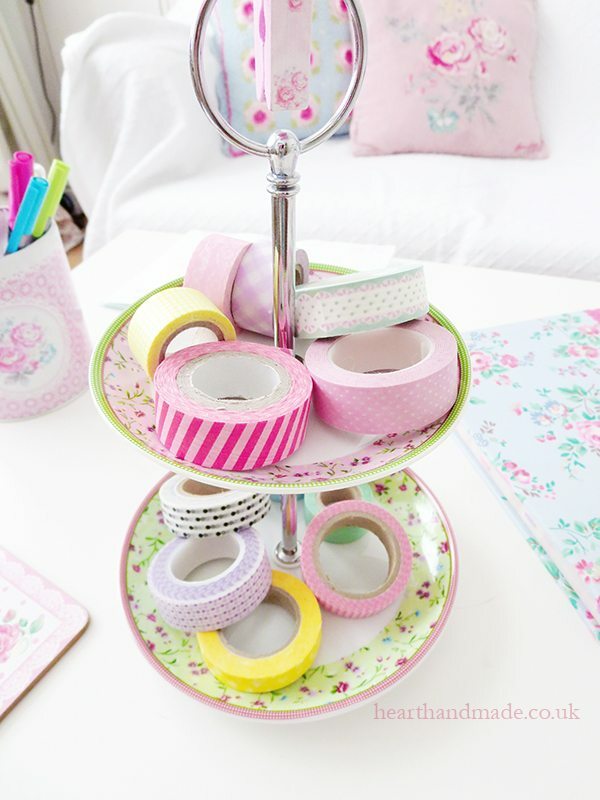 Head Over To See Some Of My Favourite Washi Tape Stores! I love them because they’re affordable! This is a marvellous custom built (by a family member) storage rack for all these tickets! 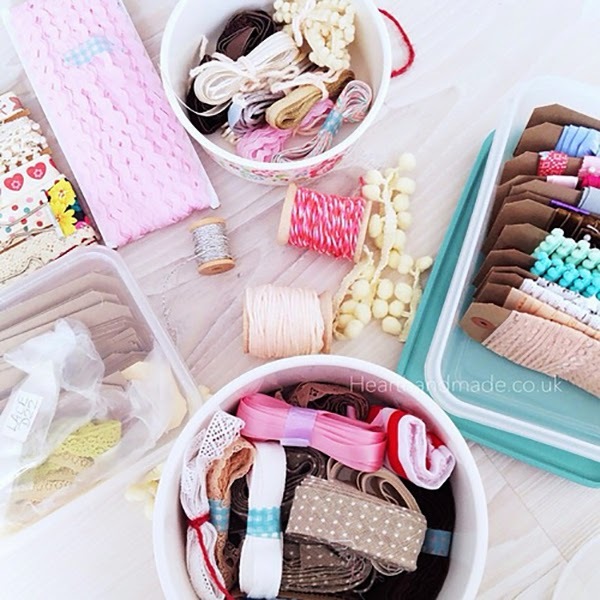 Visit Janna’s blog to see all her lovely craft storage. There are more photos of her studio on her Instagram feed. 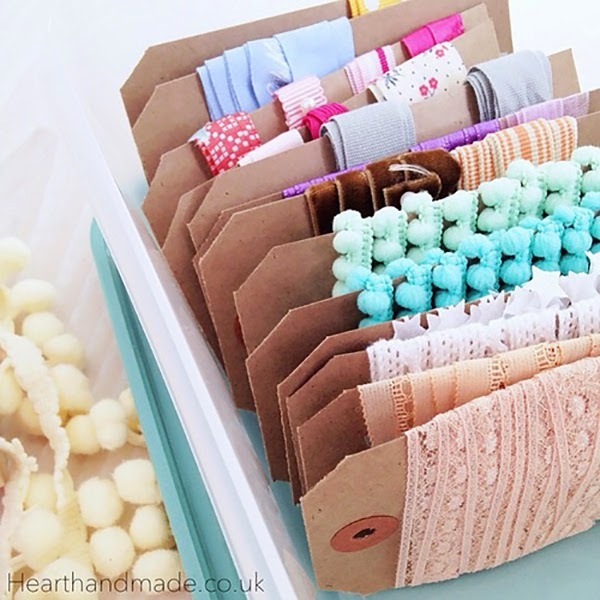 The little tin buckets are a cute way to store tapes and small things; I’d love in pastel shades, please. I love it! It’s such a bright space, and I began organising all of my supplies in take-out containers you can buy from the £/$ stores. Via Armelle Blog. I’ve since updated to sturdier plastic storage like this* after the lids became damaged a little too easily and split completely. 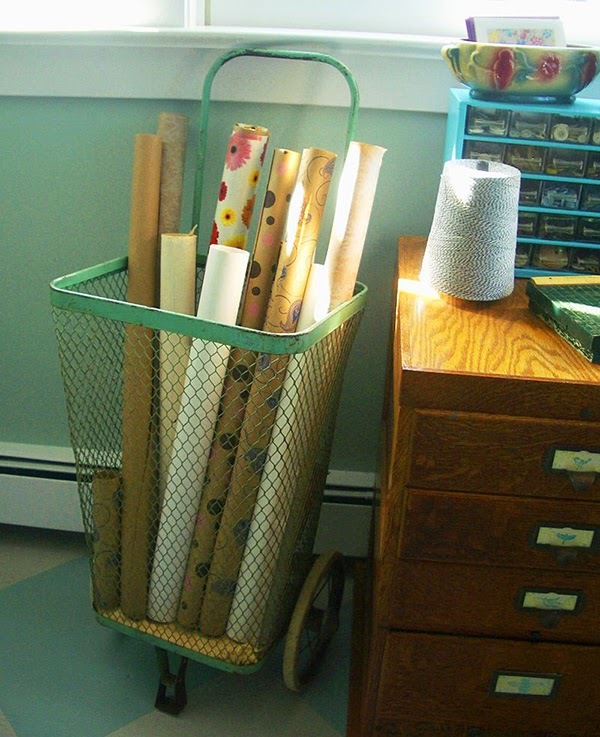 Vintage Market baskets are great ideas for wallpaper storage! Isn’t this vintage market basket rather marvellous? I think I prefer it without a lining because you get to see all of the beautiful wallpapers! Via The T-Cozy. 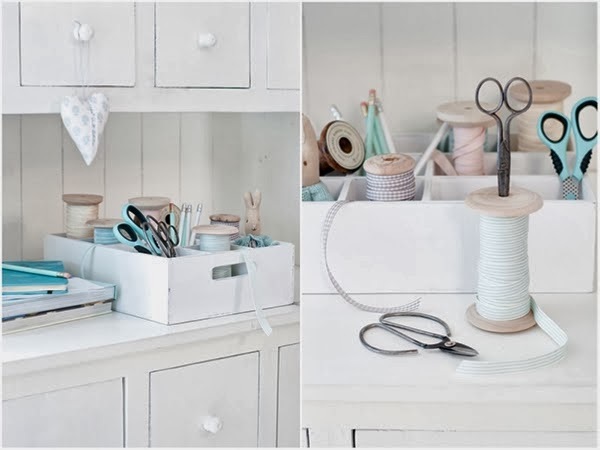 A rather smart idea – wire wall storage used as craft storage! Via Joss and Main. I checked out some wire wall storage, and there are some copper coloured ones to die for! I think I’m going to have to look for some bottle crates like this one. Children’s furniture can make excellent storage furniture! Pegboards are incredible to make the most of wall space. Drawer units can be organised and organised well! 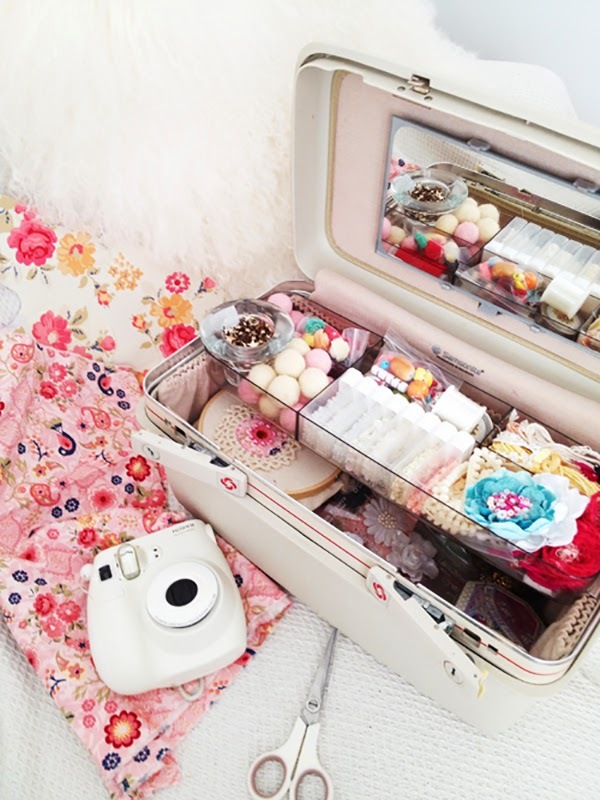 Vintage Vanity Cases can make beautiful storage for on the go crafting. Wooden bottle boxes can be fabulous storage because of the dividers. 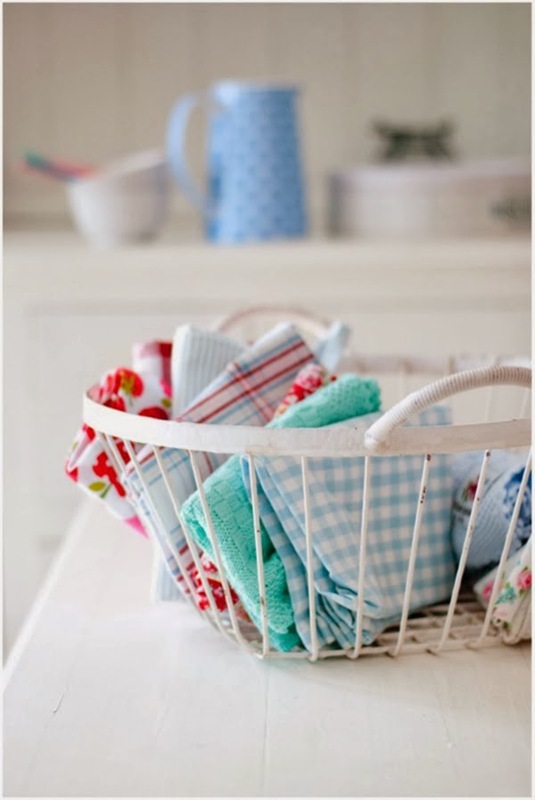 Wire baskets are just adorable and can store anything. Vintage jam jars are a beautiful style statement. Lots of tiny tins and candle holders can do a similar job. Small wooden boxes with dividers can do the same as the wine boxes. Great for sewing projects. 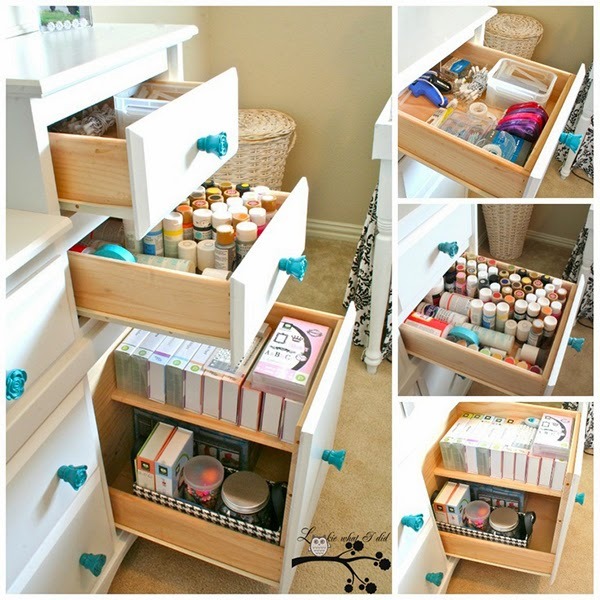 Vanity Top Trays/organizers can become great storage for notebooks etc. Repurpose large units to suit your needs. Picture ledges can be used for small items in jars. Candy jars make beautiful storage and display. Any furniture units can be modified with tabletop drawers. Tiered storage that you can hide in a cupboard? Yes, please. 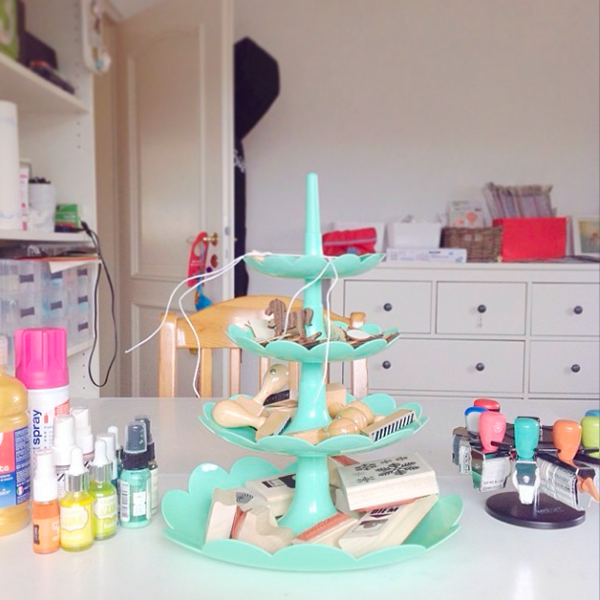 Tiered cupcake stands are great storage for washi tape and stamps etc. Little buckets can do the same job as the jars and tins above. 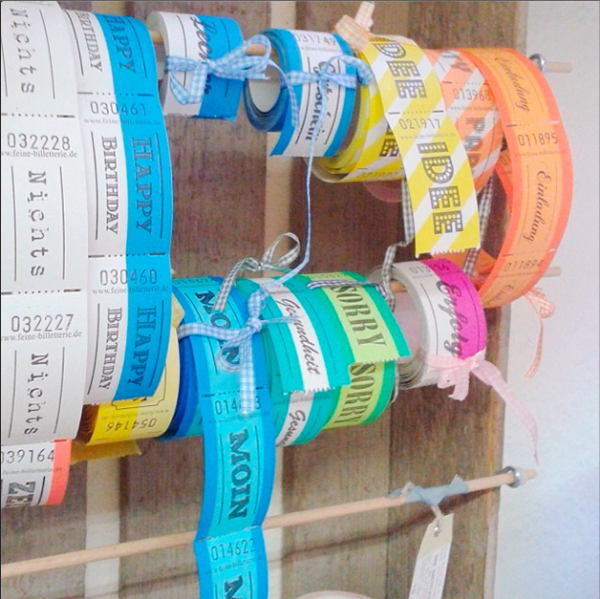 Dowel rods in hooks for ticket rolls or ribbons are a great idea. Perhaps screwed into a shadow box. Bread/Loaf Tins/Divided tins can be useful desktop storage. 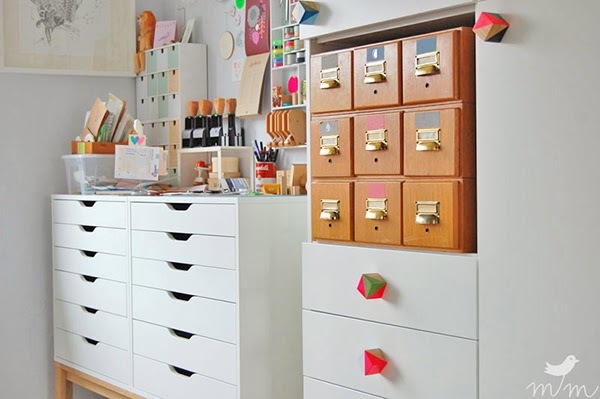 Tupperware, magazine files, dowel rods, and hooks come together to make a beautiful cabinet! 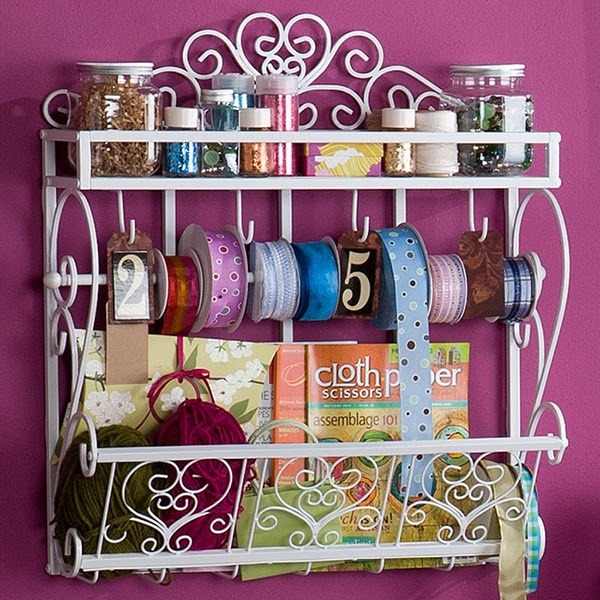 Fancy wire kitchen/bathroom organizers make pretty multi-purpose storage for the wall! Do you have any amazing storage organization ideas for me? Psssst! 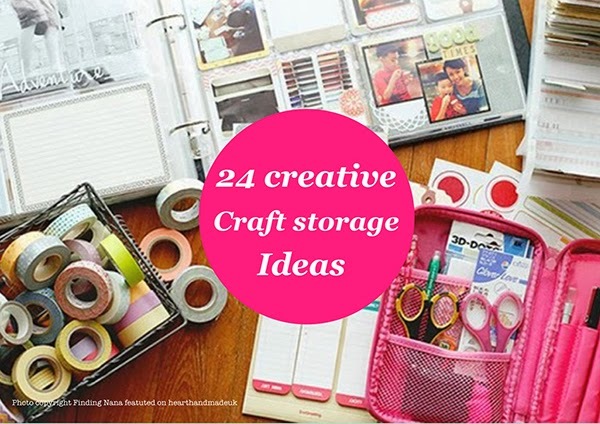 You might like my Craft Storage Ideas on Pinterest! 1. Putting Alex drawers* on tall legs and adding desktop storage*. 3.Using divided storage crates* to store paints or misting sprays. « Retro Pastel Kitchen Colors That’ll Make You Squeal! Saw on your 2013 post you are looking for white IKEA cabinet. I happened to see one on my local Craig’s List for $20. Email me if interested. I have no idea where you are located. Hi Debbie, I got all the cabinets I wanted but thank you so much for thinking of me! I love all the beautiful storage ideas. Thanks for sharing them. 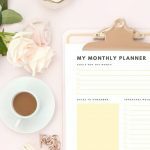 I loved all these wonderful ideas 🙂 I did try to sign up for the newsletter but it stated the page was not there. Oh no! Let me try to fix that! 1) rolls of wrapping paper. 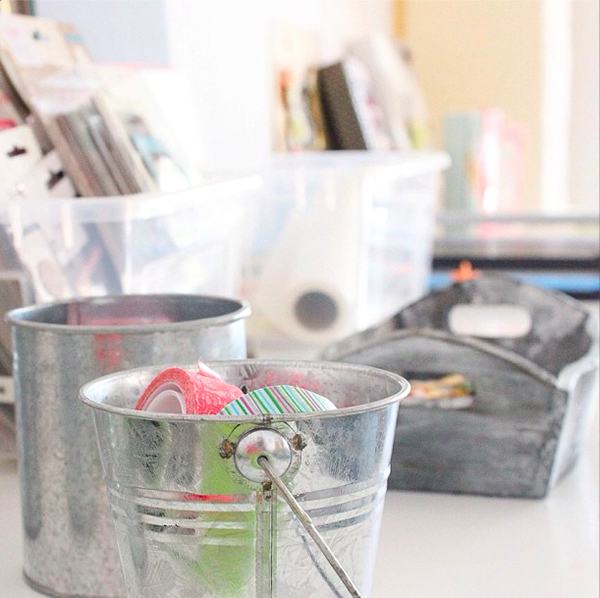 2) cover empty tin cans, put in bottle holder and use as desk tidy or similar storage. My tiny flat doesn’t allow for separate craft are and so I bought lidded plastic boxes from Wilkinson’s and covered them with a wall paper that works with my living room. Small, pretty labels advise of the contents. Boxes are stored on top of my wall unit. I use an old writing bureau as my craft area. Ikea storage boxes with little drawers sit on the top. When front flap is pulled down I have a work table. Little boxes inside for storage, and in the drawers. Once finished and door closed it’s neat and tidy again. I also use the plastic boxes that were so popular in the 70’s for baby nappy changes. The lid lifts to reveal a hinged tray. Perfect for fabric or crafts and portable thanks to inbuilt handle. Can be picked up at charity shops for a song. Pringles containers covered offer a multitude of storage options. Ikea butchers table makes a great sewing area. Machine on top, notions in drawer. WIP or fabric in pull out baskets. I found that plastic boxes from Poundland fit under bottom shelf and are just right size to slot into the empty space. Wanting to look tidy I turned the whole into a covered area. Using a large cardboard box, measured three sides of Ikea Butcher’s table cut out the cardboard to fit. This was covered with wallpaper (from Wilkinson’s boxes) 2 sides and back were attached to sides of Butchers table using strong double sided tape. The 4th side (front) was measured (add 2″ to one side, 1″ to opposite side down length), cut out and cover like the other pieces. I attached velcro to the side with extra 2″ so that it was on the underside of the extension flap. Then putting the cardboard against Butcher’s table so that both extra overlaps went over the sides, mark 2″ flap lightly in pencil on piece attached all ready. Put velcro strip to match on the cardboard attached to table and join velcro pieces together. This allows a hinge effect to open and close the front. With 1″ extension flap either leave full length or cut a tab at required point. Put vecro on tab, or equivalent place on long flap. Velcro on cardboard attached to table. You now have a neat tidy storage that can be wheeled around, and is easily changed should decor change. I use both paper and fabric for my bottle carriers.